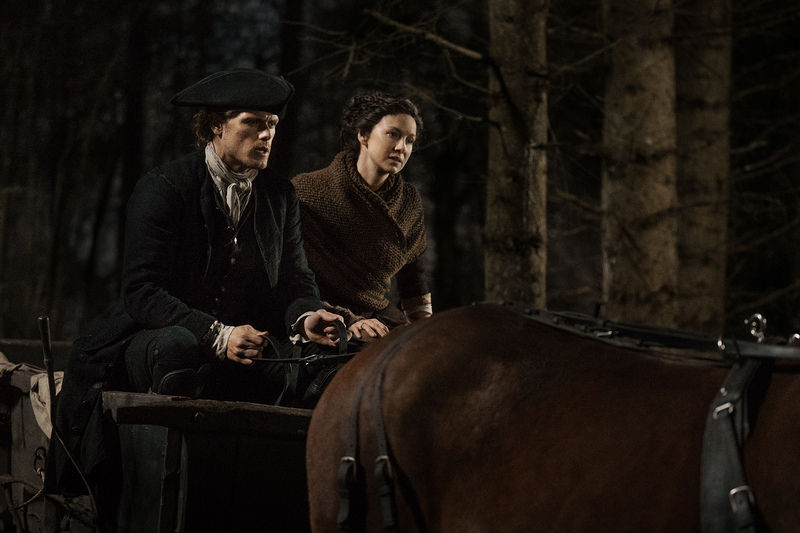 Who wants to kick off the weekend with a new edition of Outlander notes? There are a couple of different things worth talking about today pertaining to series stars Caitriona Balfe and Sam Heughan, both on the show as well as off. Let’s begin with some of the headlines away from the series, given that both actors are doing what they can right now in order to do good for other people — while also running marathons. Balfe announced some time back that she is running the London Marathon next weekend in support of World Child Cancer, a charity she actively supports. You can read more information on that over at the link here. Meanwhile, this weekend Heughan launched a new campaign in support of his My Peak Challenge Initiative (which in turn aids Bloodwise and Marie Curie) as well as Cahonas Scotland, an organization who helps to fund and raise awareness for testicular cancer research and treatment. He’s doing a t-shirt campaign, which you can purchase in the embedded tweet below, alongside a raffle to win a signed marathon running vest. For those wondering, the two marathons Heughan is set to run are the Stirling and EMF Edinburgh Marathons. Given that we’re still working on getting in shape and we’re very much thrilled just to be able to run down the street, we have all the respect in the world for these two advocating fitness while also raising money and awareness at the same time. Support @mypeakchallenge and @CahonasScotland ltd edition MPC + Cahonas T-shirt, https://t.co/PdoeGlJqr9 100% profit to Cahonas. In a new interview with TV Guide both Heughan and Balfe offered up some of their own thoughts on how to survive the current Droughtlander. There are some pretty funny responses that they have — including, apparently, drinking a part of the hiatus away to go along with reading the books and rejoicing in the fact that the hiatus this year doesn’t appear to be as long as we’ve seen it in the past. As of right now, signs point towards the fourth season premiering on Starz this fall. Related – Be sure to check out a discussion on the series’ overall longevity! To go along with that discussion we linked above, the new Friday Outlander video also discusses that subject further. If you enjoy that, be sure to subscribe to CarterMatt on YouTube right away.